How often do you buy a rotisserie chicken for dinner, then end up with lots of leftovers the next day? Here’s a great way to incorporate cooked, cubed chicken into your next meal. 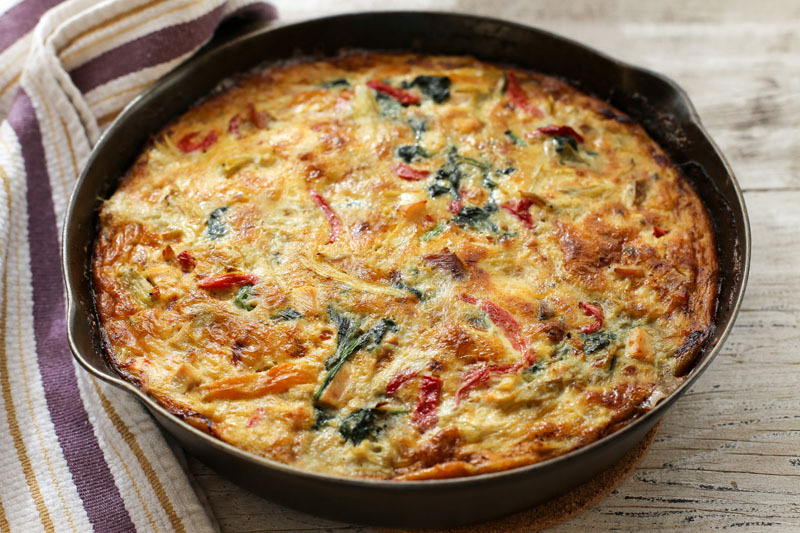 A frittata is a protein and vegetable-packed dish, perfect for brunch, lunch, or even dinner. What makes this recipe great is its use of pantry staples — with jars of artichoke hearts and roasted red peppers on hand (and some Garlic Gold®, of course! ), you’re always ready to make a great meal. Making a frittata is as easy as whipping up a morning omelet, but it feeds a big group — this recipe makes eight generously sized wedges. Serve it with a big green salad and toasted bread alongside. In a large mixing bowl, whisk together the eggs, Garlic Gold® Nuggets in Oil, and salt until the eggs are frothy and well-beaten. Stir in the chicken, artichoke hearts, bell peppers, and spinach. Heat the Garlic Gold® Oil an oven-proof 10-inch skillet over medium-high heat. When it starts to shimmer and become fragrant, add the spinach. Sauté until the leaves have wilted and no liquid remains in the pan, about five minutes. Pour the egg mixture into the skillet. Stir the spinach into the mixture then let the frittata cook for about five minutes without stirring, until you can see the edges are starting to set up. Transfer the skillet to the oven and bake the frittata until it no longer jiggles in the center, about 25-30 minutes. Next, run it under the broiler for a few more minutes, until the top is golden brown. Serve with garlic bread and a green salad for brunch, lunch, or dinner.